Dessert impresario Roger van Damme, winner of the world’s best pastry chef in 2017, sets off on a savory and sweet course through a country he loves for the second installment of this popular Belgian tv series, to find great restaurants, delicious street food, and a new cooking technique or two. The Northern part of Thailand is particularly known for its breath-taking nature with stunning green hills and endless rice fields. The cities of Chiang Mai and Chiang Rai can easily compete with many Southern beach towns in terms of tourist activities. Together with the metropolis of Bangkok and the highlights in the South, this area makes Thailand one of the most exiting destinations in the world. 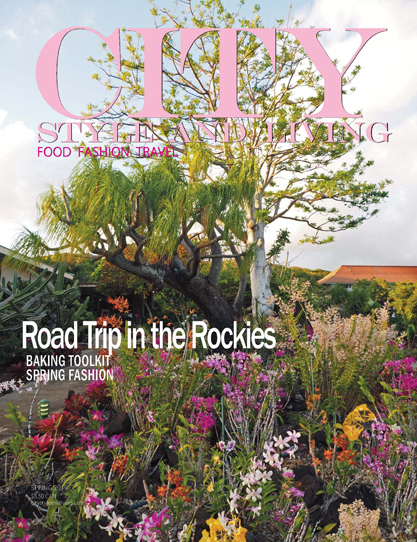 Food wise, as with everywhere in Thailand, the region is a destination in its own right. 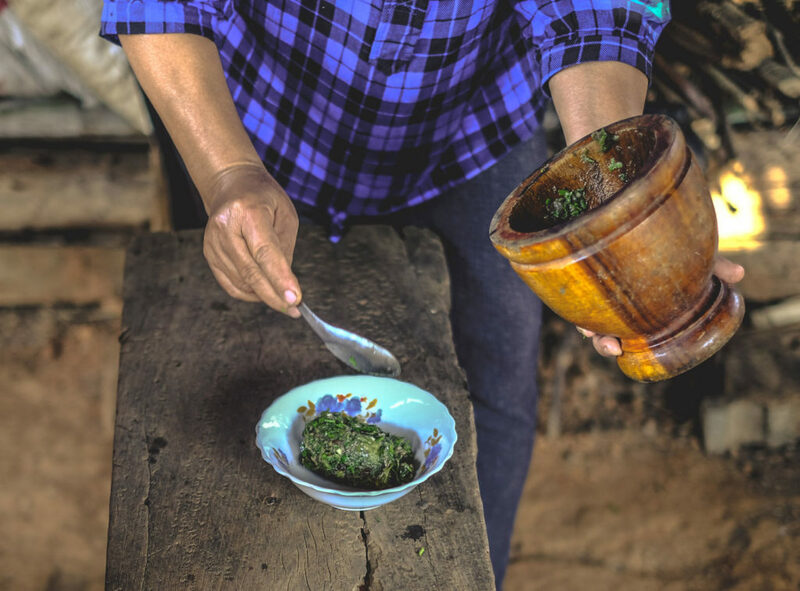 Because of its proximity to Myanmar, Laos and China, North-Thailand has a specific cuisine with influences from neighbouring countries. The food here is spicy, but not as spicy as in the Southern part of Thailand. Dishes from the North typically have more tomatoes than in other parts of Thailand and vegetables abound. Sticky rice is the standard here and is used to dip the food. There are also strawberries around Chiang Mai (make sure to try the dried ones! ), lots of pork dishes, and tea and coffee plantations. 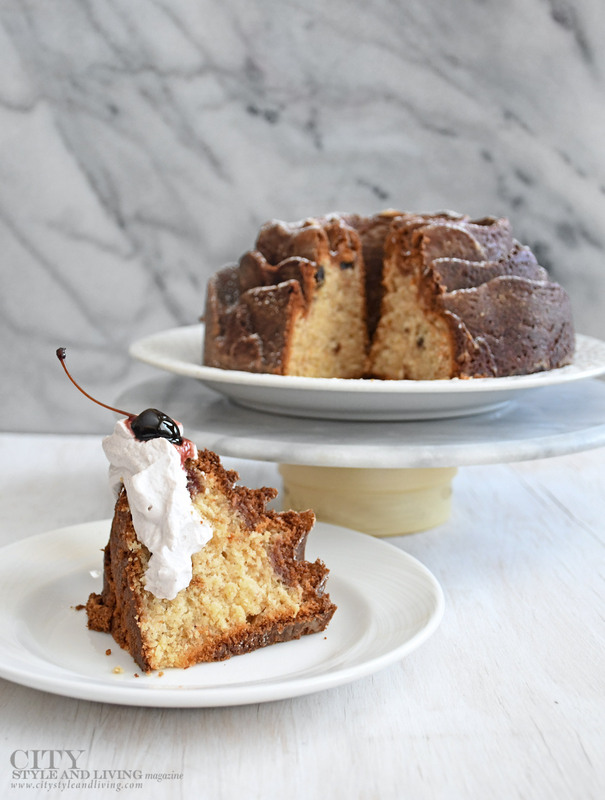 Some of the famous dishes (and must-tries!) include Khao Soi, a sort of coconut curry soup with fried and boiled noodles; Krathong Thong, a deep fried rice pastry shell with minced chicken; and Khao Niew Mamuang, coconut sticky rice with mango. Larb, a spicy salad with minced pork or mushrooms, is very common too. 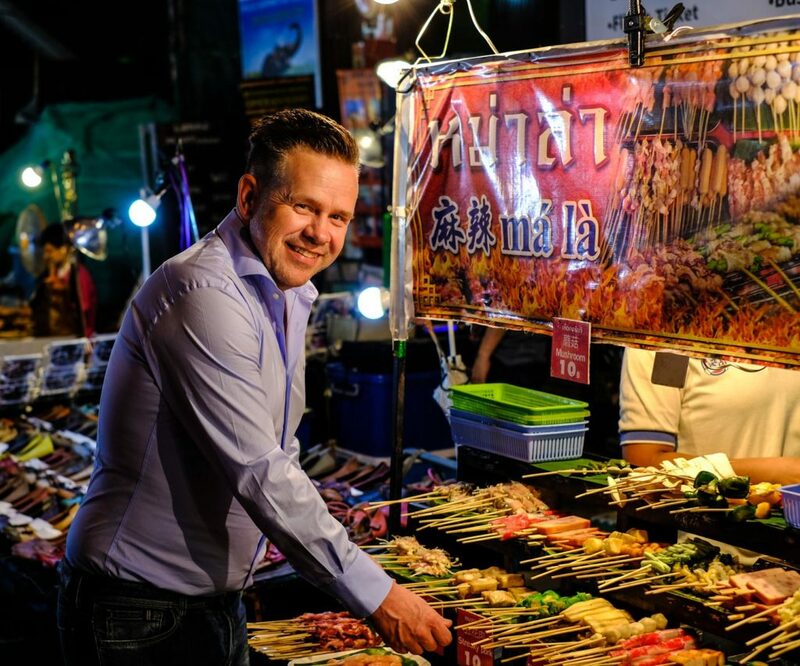 Chef Roger van Damme – famous for his great restaurant Het Gebaar in Antwerp and recently crowned best pastry chef of the world – is a big fan of the Thai kitchen. The country is one of van Damme’s favourite destinations for both (culinary) travel and of course, the delicious Thai cuisine. 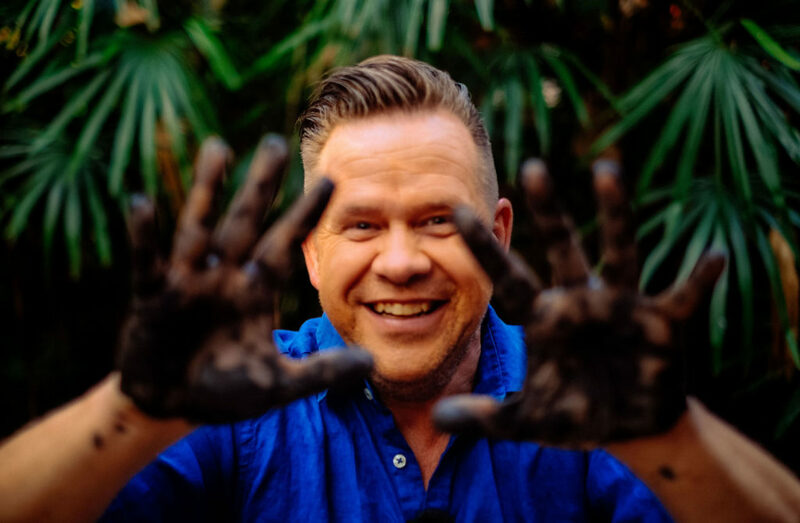 After the success of the first season of his television program, Culinair Thailand (produced by the Njam network in Belgium) chronicling his journey in the land of smiles and behind the (Thai) stove, van Damme returned to the country for season 2. Chiang Mai is located about 700 kilometres north of Bangkok, nestled between some of the greenest and highest mountains in the country. Thailand is known for the countless great day and night markets. Especially in the big cities, these markets are a true experience and encounter with the local culture. In Chiang Mai, every Sunday from 4 pm, head to the Thapae Walking Street for a beautiful and extensive night market. 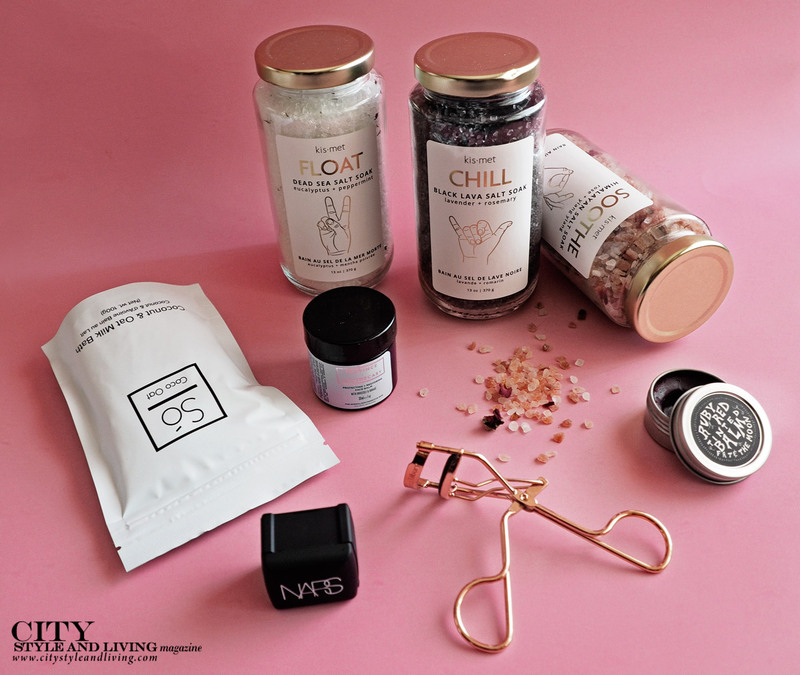 You will find hundreds of dishes and ingredients, clothing, toys and numerous gift ideas. For Roger – and actually every chef – it is a dream destination. Early in the morning is the best time to film. And what could be more fun to start filming than a nice Thai breakfast? Together with Thai Chef Thongparn of the Anantara Chiang Mai Resort at the edge of the Ping River, Roger prepared a kind of coconut pancake (kanom krok), a Thai omelet with fresh herbs, and ‘Morning Glory’ (a kind of spinach) in the wok with garlic, chili, oyster and soy sauce. Now that is waking up with a kick! Chiang Mai Province is also known for its strawberries. The weather in this region is slightly cooler, which makes strawberries grow better. Today, the strawberry farms are a tourist attraction and the red berries eventually make their way to local markets, usually dried. These delicious delicacies are made by mixing sugar with fresh strawberries and letting them dry for two days. They are not too sweet with slightly acidic notes and a pleasantly sticky texture. 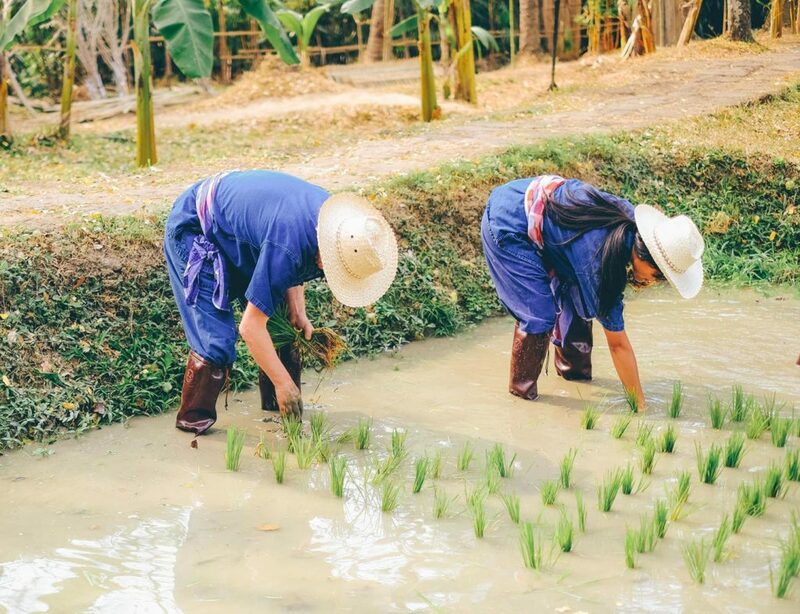 At the beautiful Four Seasons Resort Chiang Mai, you can enjoy a unique activity: cultivating rice. 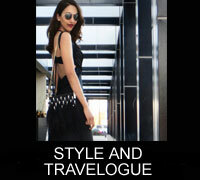 For this, you begin by dressing in a mor hom (a traditional Thai outfit). Then you actually plant the rice yourself: joining farmers to transplant sprouts from seedbeds to the rice fields. 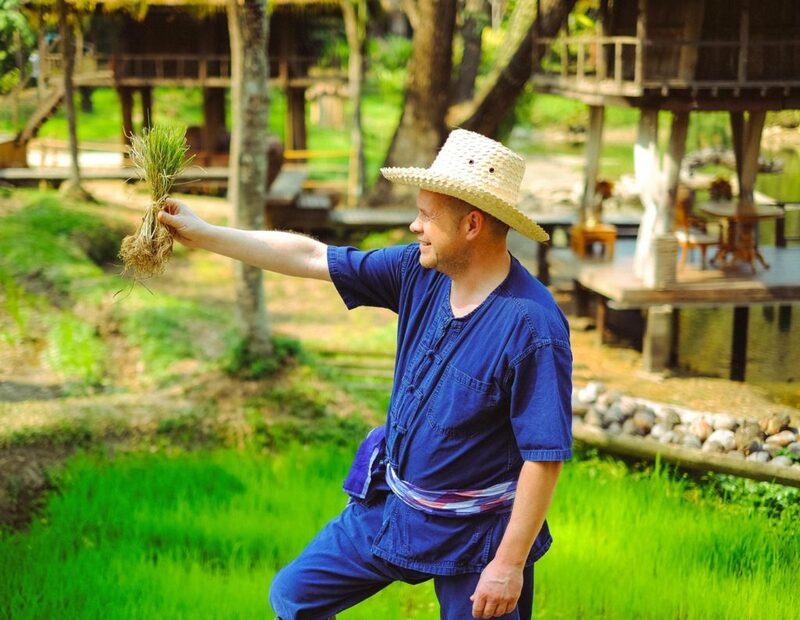 During the session, you learn how rice grows from soil to plate including how often it is harvested, how baby shoots are planned and propagated, and how the rice is threshed: an unforgettable and instructive session about one of the main ingredients in Thailand. 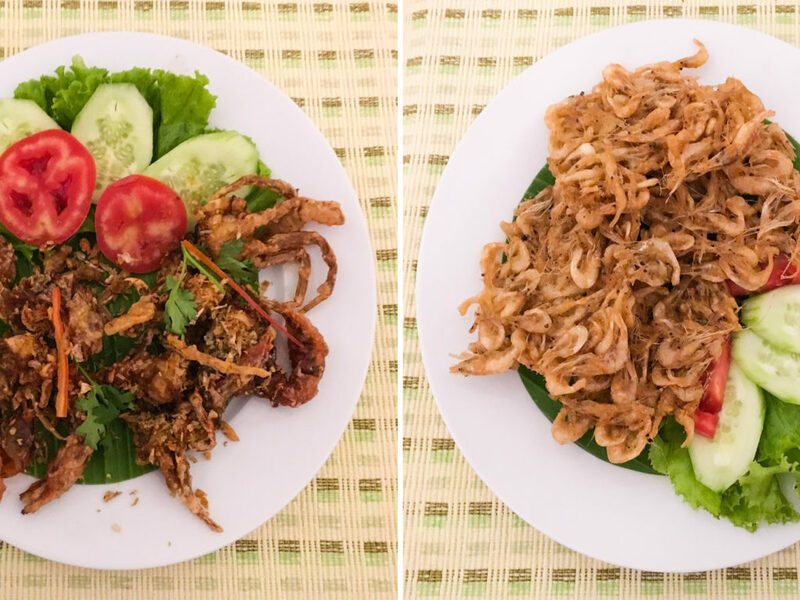 Crispy pork skin is a famous snack and side dish in Northern Thailand. It comes in different thicknesses and sizes. To make it, the pork skin is first burnt and cut and thereafter fried in lard (pig fat oil). It is fried three times: a first time around 40 minutes at 40 to 55 degrees Celsius. After that, a marinade and tempura flour are added and it is dried for 24 hours. After drying it is baked a second time for 10 minutes at 100 degrees Celsius. Finally, it is fried until crispy for only a few minutes at 160-180 degrees Celsius. Let them swell until they are nicely crisp and enjoy! You can fly from Chiang Mai to Chiang Rai, but it is actually much more fun to drive through the hills by car or bus where you’ll come across several interesting sights. A natural geyser and hot spring where you can rest your feet in the warm water, or cook your own eggs. 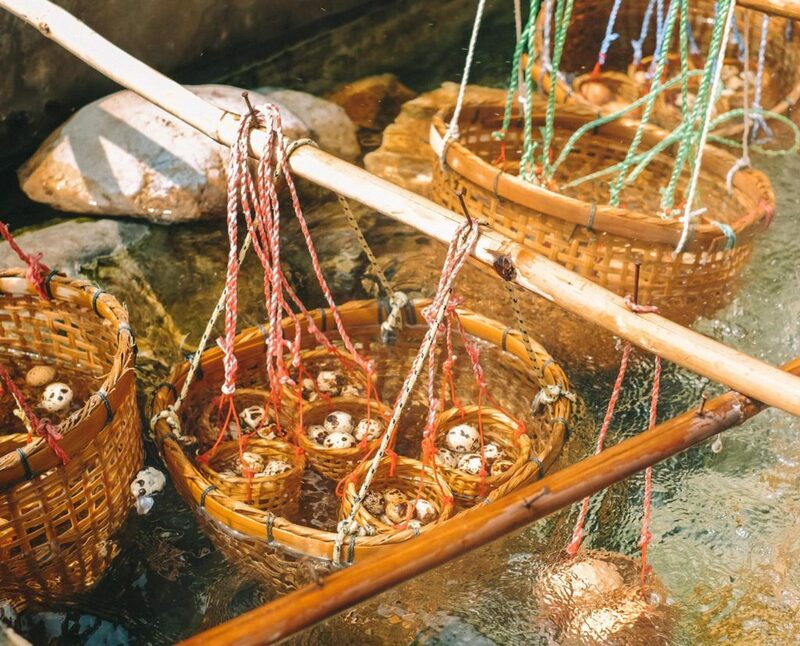 You buy small or large eggs from the locals and then cook them in small wooden baskets in the hot spring. Top them off with soy, and enjoy! A unique, completely white temple created by the Thai artist Chalermchai Kositpipat. The project was initiated in 1997 but is far from finished! Make sure to take the time to discover the many beautiful forms and creatures in and around the temple. Once at the beautiful Golden Triangle, we headed to the local market immediately. In Chiang Saen, there is a colourful, permanent market in the morning and a nice night market. We visited the first one and bought ingredients to cook with a local family afterwards. 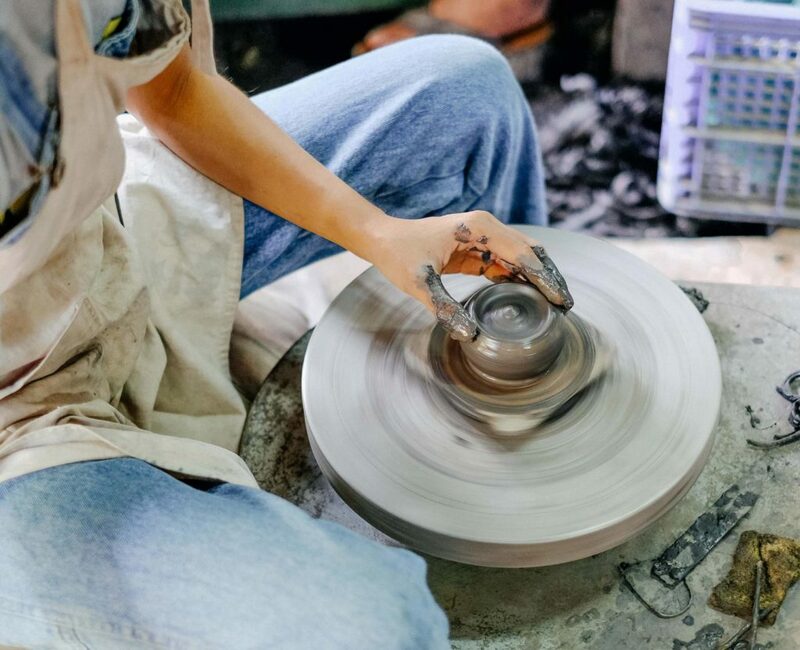 Located in the green hills about 12 km north of Chiang Rai, Doy Din Dang Pottery is the work of famous Thai artist Doi Din Dang. The artist and his team produce original pieces that are both functional and decorative and adapt them to a contemporary lifestyle. It is a beautiful place where you can also buy the artwork. Our team even got the opportunity to dirty their hands and to make some ‘works of art’ themselves. 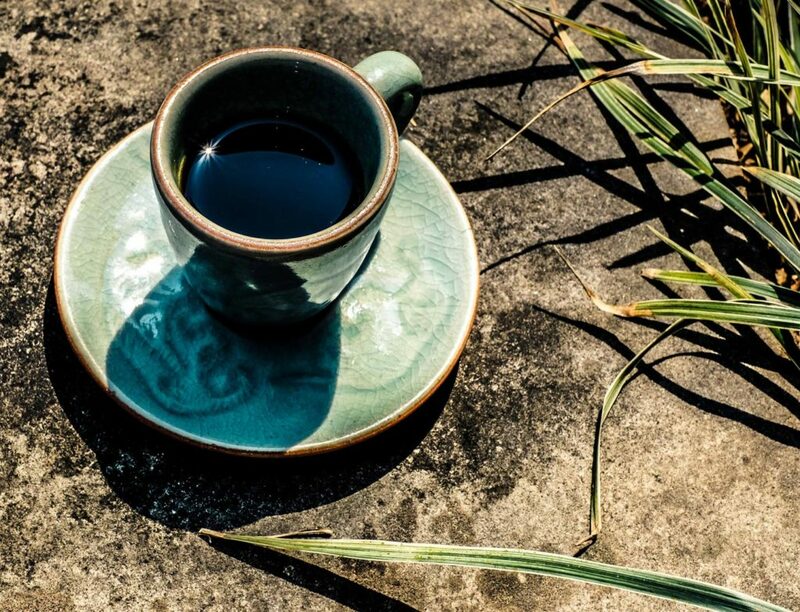 In the Anantara Golden Triangle Elephant Camp & Resort, you can sip a cup of the most expensive and rarest coffee in the world: Black Ivory Coffee. The wives of the mahouts (elephant caretakers) pick the best Thai Arabica coffee beans and use them as part of the food of the elephants. The elephants cannot digest these beans, but a sort of fermentation occurs during digestion. Afterward, the beans are excreted (yes, they have to be removed from the elephant poop). After washing (important!) and drying, a unique coffee is produced. We taste a floral aroma with notes of chocolate, nuts and berries – an accessible, not too bitter coffee with a unique flavour profile. Nice to know: this coffee is about as expensive as caviar! The end of our trip to Northern Thailand actually took place in three countries at the same time: Thailand, Laos and Cambodia. The Golden Triangle is an area of approximately 950,000 square kilometres located on the border of these three countries. In the past, the region was mainly known for its opium production, but, fortunately, this has changed considerably due to the Royal Project. Through this project, opium production was turned over to sustainable agriculture with the cultivation of vegetables, fruit, flowers and other crops, and thus a better lifestyle for the local population. Chef Stéphane Cavet hails from France but there are few people who know the culinary history of Northern Thailand better than this talented and motivated chef. 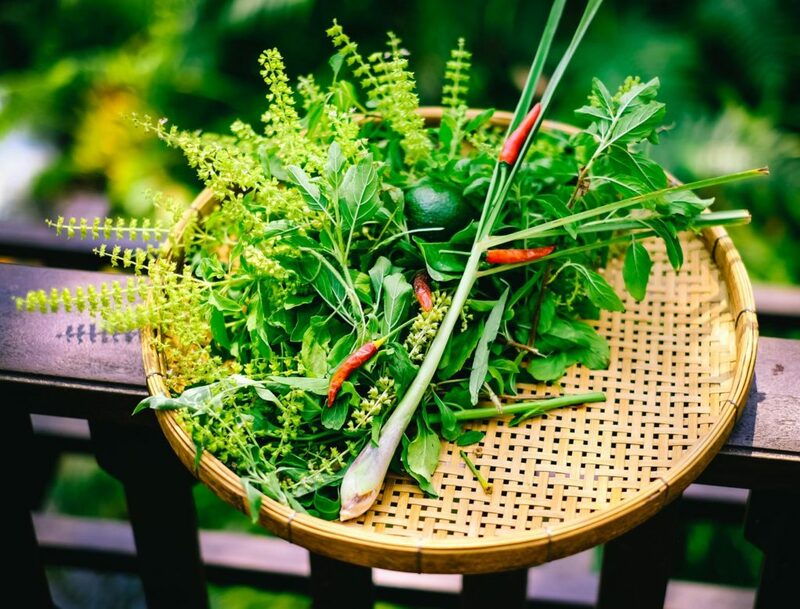 Cavet learned the magic of Thai cuisine through reading and experience. He brings together this history and flavour at his restaurant KHAO. Nestled amid beautiful rice fields and against a backdrop of mist-clad mountains, KHAO takes you on a journey with rice at its core. The word KHAO means rice and at the beginning of every meal, guests have the possibility to choose from diverse rice species like the Khao Glong Doi, delicate, tender and grown around Chiang Rai at high elevation it is comes courtesy of the famous Thai Royal Project. 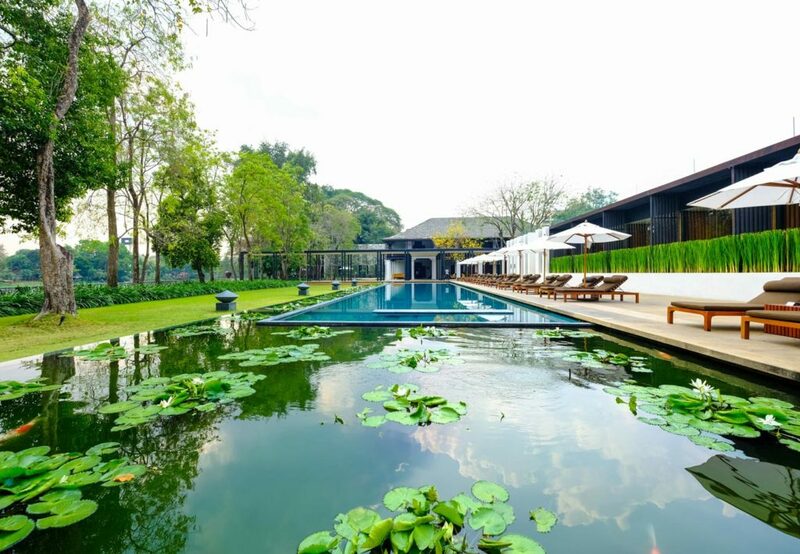 The beautiful Anantara Hotel — located right in the centre of Chiang Mai — has several interesting restaurants on offer. The Service 1921 Restaurant & Bar references the resort’s colonial house that opened in 1921 as the British Consulate of Chiang Mai. The restaurant’s interior is designed to take you back to this colonial era with its cosy, warm and classic style. It even has a secret dining room (for you to discover). The perfect way to start your meal is with a cocktail. Expert mixologists combine sweetness, saltiness, bitterness and sourness – mimicking the flavours of many dishes in Thai cuisine. A stay at the Anantara Golden Triangle Elephant Camp & Resort is an experience in itself. The resort has an on-site elephant camp, designed as a traditional mahout village. Food-wise, guests can have lunch and dinner at one of the two restaurants at the hotel itself or at a location of your choice with Dining by Design. A truly unique dining concept! What’s your choice: dinner on the terrace overlooking the mighty Mekong River, lunch in the middle of green rice fields, or dinner at a private restaurant in the bamboo forests of the elephant camp? There are no direct flights from Canada to Thailand. Fly to Bangkok from Canada via Thai Airways with connections in Asia. 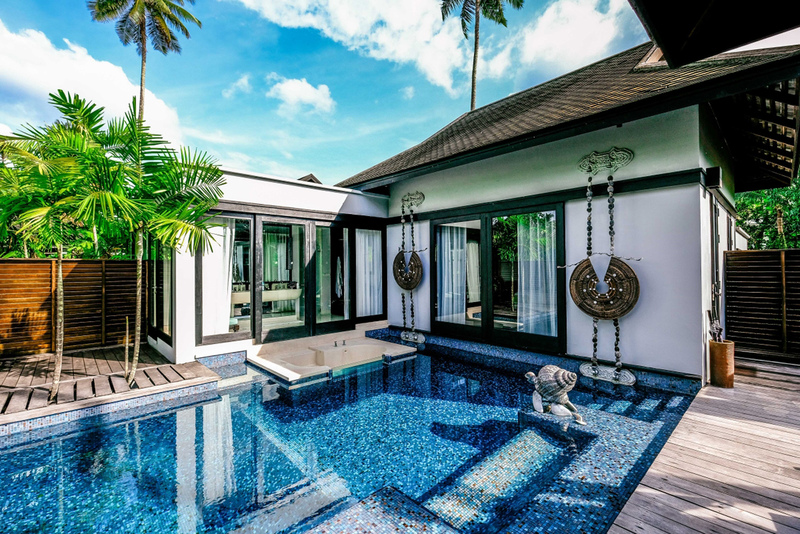 An oasis of tranquillity located near the center of Chiang Mai, the resort is a hub of gastronomy regularly inviting top chefs including Roger van Damme for workshops or to cook for guests. Rooms are decorated in a contemporary, warm style and the hotel is an ideal starting point for various excursions in the area. The exclusive resort enjoys a stunning location – perched on a ridge overlooking Myanmar, Thailand and Laos – every room opens a window to breath-taking views. It is a hotel where you can completely unwind and become one with nature. Do you want to visit the golden triangle in a truly unique way? 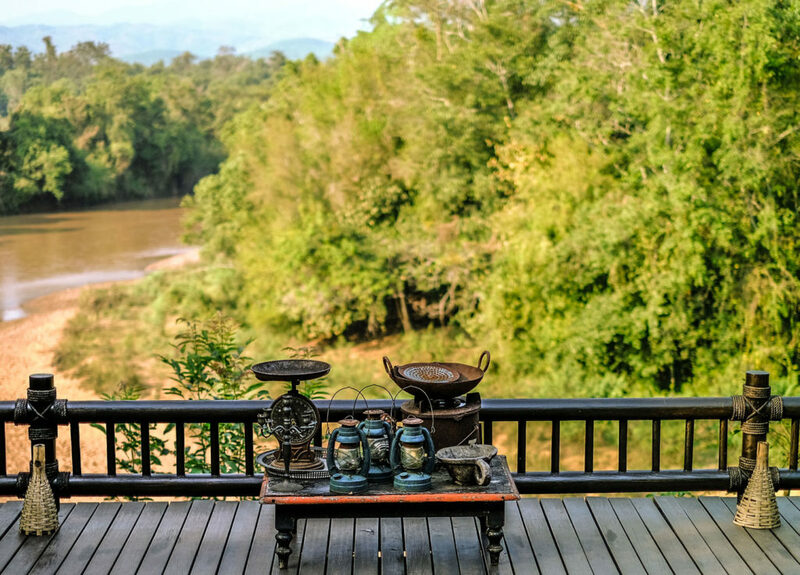 Then book a stay at the Four Seasons Tented Camp Golden Triangle. You only arrive here by boat and you will sleep in luxurious tents in the middle of the jungle. Not cheap, but an unforgettable experience! Sven Van Coillie is the owner of Belgian Taste Buds, facebook.com/Belgiantastebuds, instagram.com/belgiantastebuds and Wbpstars, facebook.com/wbpstars, instagram.com/wbpstars.